“A similar sight has not come along for maybe the last several thousand years,“ says Dalibor Dostal, the Director of European Wildlife conservation organisation. Wisents were exterminated in nature at the beginning of the twentieth century, aurochs three hundred years earlier and wild horses probably many hundreds of years ago, maybe a thousand years ago. Their last populations, however, survived at different places so they did not have any opportunity to meet in one locality for several millennia. A group of seven females have come from three Polish reserves – Pszczyna, Niepołomice and Kiermusy. The oldest animal is seven, the youngest one is two-years-old. A bull will follow them with a few days delay. An originally chosen male, in fact, did not pass strict veterinary tests. Care of the former military area, which is today a European significant locality, is also supported by the Nature Conservation Agency of the Czech Republic, which administers a part of the local estate. “I can see the preservation of specific posts with the help of big grazers as a meaningful and effective way how to take care of the being prepared national nature monument. What is more, it goes about a project which is important from a scientific point of view, and not only for natural scientists,“ said Ladislav Porizek, the Director of a regional department of Nature Conservation Agency. The aim of the large herbivores return is not only to return original species of big animals into nature, but mainly with their help to conserve and restore endangered steppe biotopes with a lot of endangered species of plants and animals, which were developing with them for thousands of years. The wisents were released into a two-hectare acclimatization enclosure. Then they will be released into a main pasture. Soon after that they will be completed by a second group of wild horses, which will come from Exmoor in England. For a natural mosaic formation, the combination of wisents and wild horses is crucial. Each of these animals, in fact, focuses on another type of food. While the wild horse graze mainly on grass, wisents graze on a different spectrum of herbs and they will more clear away self-seeding woody plants. Thanks to this a natural mosaic will be formed, which is necessary for the life of a number of endangered species of plants and animals. The first part of the conservation area was opened by European Wildlife organisation this January. They brought then the first group of wild horses from England to a locality at Milovice. In October they were completed by a group of back-bred aurochs from the Netherlands. Together with the locality at Traviny, the conservation area in the place of the former military area will reach about a hundred and sixty hectares. 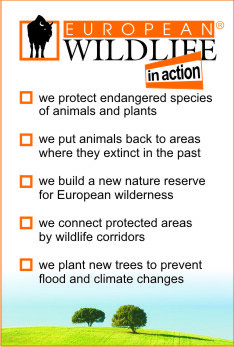 Wisents, wild horses and back-bred aurochs are used for landscape care at various places in Europe. Nowhere, however, are there all three original species of big hoofed animals in one conservation area. The conservation organisation cooperates on the projects connected with the return and conservation of big hoofed animals with experts from the Biology Centre of the Czech Academy of Sciences, South Bohemian University in Ceské Budějovice, Charles University in Prague, the Institute of Vertebrate Biology of the Czech Academy of Sciences, the Institute of Animal Science, Czech University of Life Sciences in Prague, Mendel University in Brno, Masaryk University in Brno and other specialist institutions.